Live in harmony with your backyard. 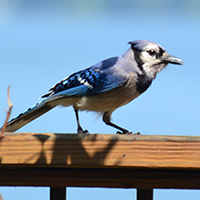 Here are some of the birds you are most likely to see in your yard. Forages actively in weeds, shrubs, and trees, often climbing about acrobatically on plants such as thistles to reach the seeds. Except during breeding season, usually, forages in flocks. 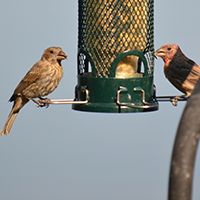 Commonly comes to feeders for small seeds. Cities, towns, lawns, farmland, forests; in winter, berry-bearing trees. Over most of the continent, summers wherever there are trees for nest sites and mud for nest material. In arid southwest, summers mainly in coniferous forest in mountains, rarely in well-watered lowland suburbs. 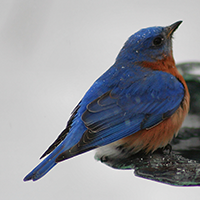 In winter, flocks gather in wooded areas where trees or shrubs have good crops of berries. Oak and pine woods, suburban gardens, groves, towns. Breeds in deciduous or mixed woods, avoiding purely coniferous forest. Maybe in fairly low or scrubby forest in southern part of range. Favors habitat with many oak or beech trees. 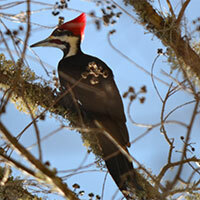 Often common in well-wooded suburbs or city parks. Forages in trees and shrubs and on ground. 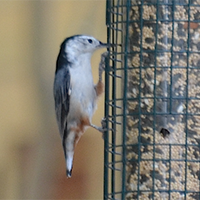 Comes to feeders for seeds or suet. Pounds on hard nuts or seeds with the bill to break them open. Will harvest acorns and store them in holes in the ground. Forages mainly on the trunk and large limbs of pines, also on higher branches and twigs. Males may forage lower than females, descending on trunks almost to the ground. May use a chip of bark as a tool to pry off other pieces of bark while searching for insects. Sometimes catches flying insects in the air. May store seeds in bark crevices. Open woods, oaks, pines, thickets. Breeding habitat varies with region. In the east, mostly in deciduous forest dominated by oak, ash, or maple, or in southern pine woods with an understory of oak. In the west, often in more scrubby habitat, including pinyon-juniper woods, chaparral, streamside trees, oak forest. Winters in wooded or brushy areas, often near water. Forages actively in trees and shrubs. Searches for insects among leafy outer twigs of deciduous trees and on branches and trunk in pines. 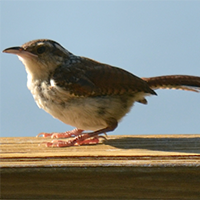 Takes most food while perched, also hovers to pick items from the surface, and often flies out to catch insects that it flushes from foliage. Large insects are beaten against a branch before being eaten. Woodland edges, thickets, suburban gardens, towns, desert washes. 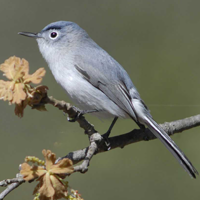 Found in a wide variety of brushy or semi-open habitats in the East, from forest clearings and swamps to city parks, almost wherever there are some dense bushes for nesting. In the Southwest, more local; occurs in tall brush, streamside thickets, groves of mesquites in the desert. Mixed and deciduous woods, river groves, shade trees. Mostly in deciduous forest, also in pine woods with a good mixture of oak or other leafy trees, and will nest in well-wooded suburbs. 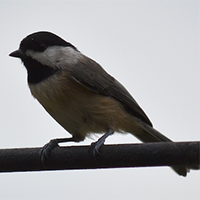 Habitat like that of Black-capped Chickadee; where the two species overlap in the Appalachians, Carolina Chickadee lives at lower elevations. Forages mostly by hopping among twigs and branches and gleaning food from the surface, often hanging upside down to reach the underside of branches. 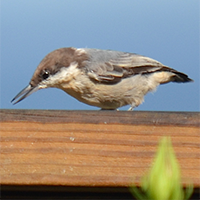 Sometimes takes food while hovering, and may fly out to catch insects in mid-air. Stores food items, retrieving them later. 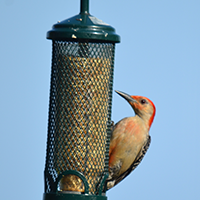 Comes to bird feeders for seeds or suet. Forages in pairs, actively exploring low tangles, foliage, bark of trunks and branches, and the ground. 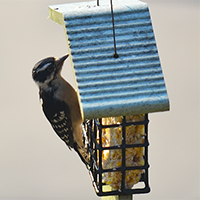 Sometimes comes to bird feeders for suet, peanuts, other items. Forests, woodlots, willows, river groves, orchards, shade trees. Found in a wide variety of habitats, from wilderness areas to second-growth woods to suburban yards, but generally, favors deciduous trees. In far north and mountains (areas dominated by conifers), restricted to groves of deciduous trees such as aspens or willows. Can forage not only on trunks and major limbs of trees but also on minor branches and twigs (often climbing about acrobatically and hanging upside down), as well as on shrubs and weed stalks. Male and female forage differently at times, but this varies with place and season. Feeding on trees, does more tapping and excavating in winter, more gleaning from the surface in summer. Does much foraging by perching low and fluttering down to ground to catch insects, often hovering to pick up items rather than landing. Also catches some insects in mid-air, and may take some while hovering among the foliage. 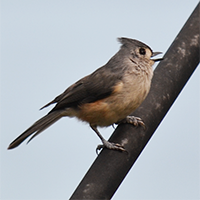 Feeds on berries by perching or making short hovering flights in trees. Forages on ground, while perching in weeds, or up in trees and shrubs. Except when nesting, usually forages in flocks. 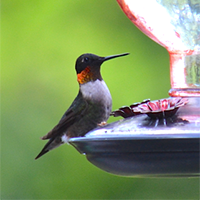 Will come to feeders for seeds, especially sunflower seeds, and to hummingbird feeders for sugar water. Farms, towns, open woods, roadsides, grasslands. Found in almost any open or semi-open habitat in temperate parts of North America, including forest clearings, farmland, suburbs, prairies, deserts. May be most common in edge habitats having both trees and open ground, but also found in some treeless areas. Avoids unbroken forest. 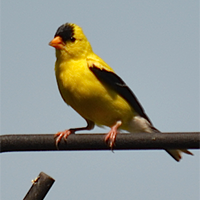 Forages mostly on the ground; sometimes will perch on plants to take seeds. 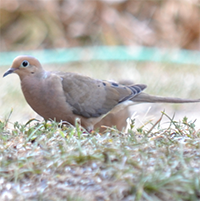 Will come to bird feeders, often eating on the ground under elevated feeders. Eats quickly to fill crop with seeds, then digests them while resting. 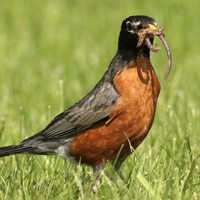 Regularly swallows grit (small gravel) to aid in the digestion of hard seeds. Conifer, mixed, and hardwood forests; woodlots. Favors mature deciduous or mixed deciduous-coniferous forest, also coniferous forest. A wide variety of specific forest types from southern swamps to the old-growth Douglas-fir forest of the northwest. Also in second-growth and fragmented woodlots, as long as some large trees are present. Gardens, wood edges. Summers in a variety of semi-open habitats, including open woods, clearings, and edges in forest, gardens, city parks. Winters mostly in rather open or dry tropical scrub, not usually in the rain forest. Migrants may pause in any open habitat with flowers. Woodlands, shade trees, groves. Mostly in the deciduous forest with tall trees, sometimes in mixed forest. Can live in orchards, suburbs, or even city parks if trees are large enough. Forages by hopping actively among branches and twigs of trees, often hanging upside down, sometimes hovering momentarily. Often drops to the ground for food as well. 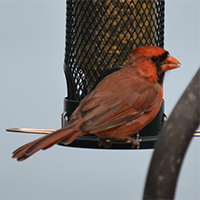 Comes to bird feeders for seeds or suet. Opens acorns and seeds by holding them with feet and pounding with the bill. Will store food items, retrieving them later. Forests, woodlots, groves, shade trees. Typically in a mature deciduous forest, also in mixed forest with some conifers; rarely found in a pure coniferous forest. Often favors woodland edge, along rivers, roads, clearings; may be in suburbs or parks as long as large trees are present. Forages mainly on the trunk and larger limbs of trees, climbing about and exploring all surfaces. Sometimes feeds on the ground. During fall and winter, regularly catches food items in bark crevices on territory.